In Missouri a septic inspection is a comprehensive inspection of the on-site wastewater treatment system. They are usually performed for real estate transaction purposes. Although inspections are required, they do not guarantee the long-term functioning of a system. Some counties have additional requirements for inspections in addition to state requirements. Envirotek Systems has trained inspectors who are licensed with the state and local counties. What’s involved in a septic inspection? In the septic inspection process information must be obtained that pertains to the facility. Is it a single, multi-family or business facility? How many number of occupants, bedrooms and garbage disposals does it have? There must be water samples taken if the water system is providing service to 7 properties or less. We ensure the tank and sewer line accept flow from house without backing up. The system’s history including age, permit and repair information must be provided if available. Another involvement is to expose the entire top of the tank and the inlet and outlet pipes. Inspect the tank, risers (if any) and lids for water-tightness of both ex-filtration and infiltration. Our septic inspection measures the sludge and scum levels to observe the components. We recommend septic tank pumping if the sludge and scum levels indicate the need. Our service tests the condition and functionality of any pumps, controls or advanced treatment components associated with system. Then we perform a hydraulic load on the dispersal field. This is accomplished by introducing specific amounts of water based on the number of bedrooms. A determination is made whether the dispersal field accepts a hydraulic load without backing up into the tank. We test to see if the surfacing effluent is observed due to the dispersal field hydraulic load. 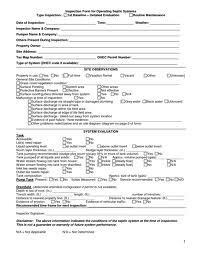 In the state of Missouri and certain counties there are required records of the septic inspection to be kept on file. At Envirotek Systems we record the type and size of the tank. We record the existence and condition of the tank inlet and outlet baffles and/or inlet and outlet tees. The existence of the sewer line clean-out between the house and tank must be on file. We use every house plumbing fixture and record whether it’s connected to the tank. We keep on record the setback distances to the property lines, dwellings, wells, lakes and streams. A sketch of the property is provided including the dwelling, location of system components, well and property dimensions.